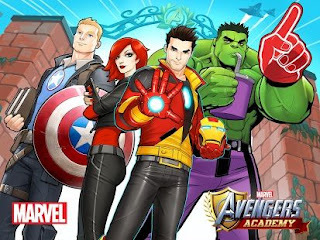 Last week, TinyCo launched a new game for iOS and Android devices called Avengers Academy. It's not, in fact, a fighting game of any sort (which has evidently annoyed some users) but what I call a resource management type of game. As a player, you direct the characters to use their (and your!) time to improve their skills and/or advance the plot. As is typical with these types of games, there can be a fair amount of tedium while you wait for tasks to be finished, but they can be sped up with tokens that can be won in the game... or by purchasing them in larger quantities. This is, of course, how these games generate money -- they're designed in a way that can be completed for free, but only at a snail's pace, so that user's drop real-world money in order to get to the next part of the game. The game has some wonderful animations and smooth play that do make it worth watching. But they've also done two things that I think are critical here: 1) they've crafted a legitimate and new story for the game, and 2) they've redesigned the Marvel universe from the ground up. The importance of that first point should be fairly obvious. A new and well-crafted story is going to keep players engaged, and more likely to be interested in continuing on to the next level. There's enough hints and promises of things to come to keep a player intrigued, but not in such a way as to over-sell what's actually in store. It's not about just getting enough maguffins to unlock the Thor character; there's a broader story about defeating Hydra and discovering the secret of the mysterious "timefog." So as a user, there's an ongoing series of engagements that keep players interested and coming back again and again. While it's obvious that the characters and backgrounds have been radically redesigned, the significance of that may not be as easily grasped. The primary conceit of the game is that nearly all the heroes you're familiar with are all in the late teens and going to "Avengers Academy" for training. This does a few things within the context of the game and the players. First, it establishes all the characters as more-or-less equal We don't have decades of history and context to need to figure out this Captain America." Every character here starts on a level playing field. Second, the complete redesign gives the creators a greater license to focus on a more diverse cast. The gender make-up is about half men and half women, and among them are included Falcon, War Machine, the current Ms. Marvel, and the whole group is run by Nick Fury Jr. Long-time Avengers fans who are expecting to see more traditional versions of what has historically been a predominantly white male group aren't seeing ANY characters they recognize, so there's less concern about why their favorite isn't represented. "They didn't even use the real Iron Man or Captain America anyway, so why would I even bother bitching about not seeing Stingray?" Further, the redesigns give Marvel essentially another set of characters to promote. People who aren't perhaps partial to the darker, fight-heavy scenes and portrayals in the movies and comics, might appreciate the still-adult-but-somewhat-softer approach in Avengers Academy. There seems to be a fairly heavy (for this type of game) marketing push to make this a successful game; it will be interesting to see if/when/how Marvel might capitalize on that in their comics. Despite having some comics at the time, they largely missed the boat there with Super Hero Squad, seemingly unable to get the books to the audience that was watching the show. Let's see if the different audience for Avengers Academy makes it any easier for them.